NetworkNewsWire Editorial Coverage: A recent change in United States law has led to a gold rush in the gaming industry as numerous companies scramble to set up sports gambling operations. The U.S. Supreme Court’s overruling of 1992 gambling legislation essentially makes sports betting widely legal throughout the country. Casinos are moving to make the most of this by opening sports books. Technology companies are also exploring possible revenue avenues through online gambling apps. The United States is set to see a $3–$5 billion take in the global sports betting market within a few years — a market already worth an estimated $40 billion. One of the new players in the sports gambling space is SinglePoint, Inc. (OTCQB: SING) (SING Profile), a tech company focused on innovation that has invested in gambling app StakeHaul. In the world of big gambling, casino companies such as Caesars Entertainment Corp. (NASDAQ: CZR) are exploring ways to add sports gambling to their existing entertainment rosters. MGM Resorts International (NYSE: MGM) already provides sports gaming alongside traditional betting options. Following suit, Penn National Gaming, Inc. (NASDAQ: PENN) has started offering sports betting at some of its casinos, as has Boyd Gaming Corp. (NYSE: BYD), which is also entering the online gambling space. From soccer in Europe to cricket in India, people enjoy betting on the outcome of sports competitions. 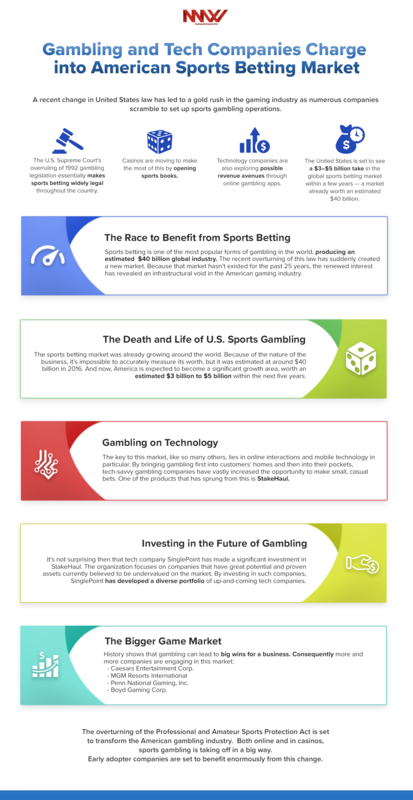 In fact, sports betting is one of the most popular forms of gambling in the world, producing an estimated $40 billion global industry that includes local bookmakers to national brands to international betting websites. In the United States, this type of betting has been extremely limited since the early 1990s. Legislation designed to protect people from the harmful effects of gambling effectively made betting on sports illegal across the country, with limited exceptions in a handful of states. The recent overturning of this law has suddenly created a new market. Because that market hasn’t existed for the past 25 years, the renewed interest has revealed an infrastructural void in the American gaming industry. Technological innovations have not been applied to sports gambling, so companies are now playing catch up. The results will shape an industry estimated to be worth billions of dollars every year. This year is seeing a number of gambling companies expand their operations to include sports betting while tech companies such as SinglePoint, Inc. (OTCQB: SING) are looking at what they can do to fill a commercial void. But how did this gap in the gambling market come about in the first place? The Professional and Amateur Sports Protection Act (PASPA) was passed by the U.S. Congress in 1992. It effectively outlawed betting on sports across the United States, with limited exceptions, including specific forms of racing; sports lotteries in Delaware, Montana and Oregon; and licensed pools in Nevada. The law quickly became an unpopular one. By 2017, a majority of Americans reportedly wanted to see sports betting legalized so they could join in a pastime enjoyed by millions around the world. Several attempts were made to overturn the law, eventually resulting in a legal case being heard before the Supreme Court. In May, the court overturned PASPA, declaring that the law violated the 10th Constitutional Amendment. The sports betting market was already growing around the world. Because of the nature of the business and the lack of centrally collected figures, it’s impossible to accurately measure its worth, but it was estimated at around $40 billion in 2016. And now, America is expected to become a significant growth area, worth an estimated $3 billion to $5 billion within the next five years. That’s a lot of money. So how does a company such as SinglePoint go about getting a piece of the acton? The key to this market, like so many others, lies in online interactions and mobile technology in particular. By bringing gambling first into customers’ homes and then into their pockets, tech-savvy gambling companies have vastly increased the opportunity to make small, casual bets. One of the products that has sprung from this is StakeHaul. A mobile gambling platform, StakeHaul allows users to bet on anything. Whether it’s a traditional test of machismo such as who can do the most pull-ups, a motivational bet on who will complete a chore first, or even a gamble on the outcome of world events, StakeHaul can make it happen. And with sports betting now apparently legal in the United States, StakeHaul can include that too. StakeHaul makes it easy to carry out the sort of casual bets traditionally placed in person. The stakes need be nothing more than the honor of knowing who won, although they can just as easily be financial. The company is currently finalizing a peer-to-peer payment model that can pay out in either U.S. dollars or cryptocurrency. With internet native currencies on the rise, it makes sense for an online gambling system to recognize those types of transactions. With more than 70,000 downloads, StakeHaul is currently the top-ranked app for making bets with friends — and those numbers are steadily increasing. Each month has seen a double-digit percentage rise in active users and bets placed through the platform. With more than a third of Americans betting on at least one sports event every year, there are plenty of people looking to make the most of the newly loosened laws, and StakeHaul provides a way to do that. “All in all, our unique features, our ease of use, and the legal momentum behind betting in the U.S. makes our opportunity not just a home run but a grand slam,” stated Jeffery Lippert, founder of StakeHaul. It’s not surprising then that tech company SinglePoint has made an investment in StakeHaul. Originally a full-service mobile technology provider, SinglePoint has evolved into a company with an interest in a wide range of technologies. The organization focuses on companies that have great potential and proven assets currently believed to be undervalued on the market. By investing in such companies, SinglePoint has developed a diverse portfolio of up-and-coming tech companies. Payment systems play a large part in SinglePoint’s holdings. The global payment market is changing, with finance increasingly transacted online or with smartphones. SinglePoint’s payment processing systems are designed to deal with this new world. It is also working to provide cryptocurrency payment systems using Bitcoin and Ethereum, the leading global cryptocurrencies. These are technologies that will fit well with the financial side of the company’s investment in StakeHaul. But it’s not all about electronic payment. SinglePoint has teamed up with New Sun Energies to provide cost effective solar power in six states. With interests in blockchain, renewable energy and the sports betting market, the company has investments in several sectors that are due to see considerable growth over the next decade. History shows that gambling can lead to big wins for a business. Caesars Entertainment Corp. (NASDAQ: CZR) started off as a single bingo parlor in 1930s Nevada. Over the decades, it’s become the most famous name in gaming, with 47 casinos in five countries. Its buildings play host to conventions, meetings and hundreds of thousands of tourists. The thrill of betting keeps the customers coming through the doors of those casinos and has helped to build up a legendary reputation as a place of decadence and entertainment, a reputation that also helps explain the success of over 600 bars, restaurants and clubs across the United States. With its string of hotels and casinos, MGM Resorts International (NYSE: MGM) has done a job similar to Caesars’ in turning the pleasure of gambling into a multimillion-dollar entertainment empire. Even before PASPA was struck down, MGM was profiting from sports betting as well as traditional gambling, thanks to the popularity of its venues. Hosting events such as world-class boxing matches means not just ticket receipts but also a flood of fans using the hotels and their facilities. Penn National Gaming, Inc. (NASDAQ: PENN) might not have the glamor of the big names, but the company is still a very successful operator in the American gambling sector. It has gaming, racing and video gaming terminals spread across 29 facilities in the United States and Canada, with a focus on slot machines. The recent legal change is creating more options, and the company recently started offering sports betting at Hollywood Casino at Charles Town Races in West Virginia. One of the largest casino companies in the United States, Boyd Gaming Corp. (NYSE: BYD) has 24 gaming properties spread across seven states. The company runs 10 sports betting operations across Nevada and has recently opened sports books at two of its Mississippi properties. It has also teamed up with FanDuel Group to engage in online betting and sports gaming opportunities across the country. The overturning of PASPA is set to transform the American gambling industry. Both online and in casinos, sports gambling is taking off in a big way. Early adopter companies are set to benefit enormously from this change.